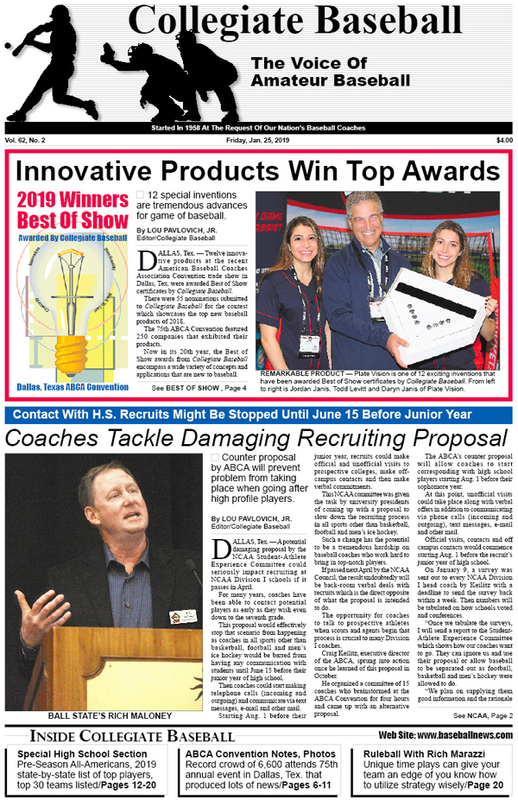 • 12 Innovative Products Win Top Baseball Awards: 2019 Best Of Show winners are tremendous advances for game. • Damaging Recruiting Proposal: Contact with H.S. recruits might be stopped until June 15 before junior year. ABCA counter proposal will help prevent serious problem, if approved. • Special High School Pre-Season Section: Collegiate Baseball takes a look at the top 30 teams in the USA, pre-season All-Americans and state-by-state list of top prep players. • Argyle (TX) Loaded At No. 1: Collegiate Baseball’s National High School Top 30, presented by Diamond Pro, headed by Argyle (TX) which rolled to 37-0 record last season.The Eagles return eight starters from a team which hit .387, averaged 8.9 runs per game, stole 112 bases and had a 1.12 team ERA with 255 strikeouts. • Pre-Season High School All-Americans: 2019 Collegiate Baseball Pre-Season H.S. All-Americans, powered by Diamond Sports, feature elite athletes across the USA. • High School State-By-State List: Exclusive list of top high school players in every baseball playing state is explored in our annual rundown of superb players across nation. • ABCA Convention All-Time Record Crowd: Attendance mark is obliterated as 6,600 attend 75th annual event in Dallas, Tex. • ABCA Convention News: Ejections in NCAA baseball up again, speed up rules allowed but not 20-second play clock with men on base, attendance down at College World Series, television numbers up, flat-seam ball use positive once again. • ABCA Convention Photos: Five pages of photos document memorable speakers, award winners, great products at world’s largest baseball event. • Lou Pavlovich Column: After 75 ABCA Conventions, one coach stood out more than any other in John Scolinos. This gifted and entertaining clinician always had a message with his wild presentations that nobody will ever forget. • Paul Mainieri Wins Dedeaux Award: LSU skipper captures prestigious award for his superb work with USA Baseball. • Ruleball With Rich Marazzi: Unique time plays can give your team an edge if you know how to utilize strategy wisely. • Hill Denson Will Retire: Skipper at Belhaven, who previously coached at Southern Mississippi, has racked up 1,284 wins during remarkable 33-year career. • Bryan Conger Resigns: Tarleton State head coach steps down to take position with Texas Rangers’ organization. • NCAA Div. 3 Players To Watch: More players are listed in this annual rundown. To purchase the Jan. 25, 2019 edition of Collegiate Baseball or subscribe, CLICK HERE.